Temple Grandin, Ph.D., is one of the most accomplished and well-known adults with autism in the world. Her life was brought to the screen with the HBO full-length film Temple Grandin, starring Claire Danes. Grandin developed her talents into a successful career as a livestock-handling equipment designer, one of very few in the world. She speaks on both autism and livestock handling, and has authored numerous books on both topics. Grandin is considered a philosophical leader of both the animal welfare and autism advocacy movements. Temple Grandin, Ph.D., is one of the the most accomplished and well-known adults with autism in the world. Now her fascinating life, with all its challenges and successes, has been brought to the screen with the HBO full-length film “Temple Grandin”, starring Claire Danes, which won seven Emmy awards and a Golden Globe. The movie shows her life as a teenager and how she started her career. Dr. Grandin is a 2017 inductee into National Women’s Hall of Fame, and was inducted into the American Academy of Arts and Sciences in September 2016, and she has a 2010 TED Lecture titled "The World Needs ALL Kinds of Minds." She has been featured on major television programs, including the BBC special "The Woman Who Thinks Like a Cow", ABC's "Primetime Live", "The Today Show", "Larry King Live", "48 Hours", and "20/20", and has been written about in many national publications, including Time (she was included in the 2010 edition of the magazine's annual "Time 100" List of the world's most influential people), People, Forbes, US News and World Report, and The New York Times. Among numerous other recognitions by media, Bravo did a half-hour show on her life, and she was featured in the best-selling book Anthropologist from Mars. Grandin is a designer of livestock handling facilities and a Professor of Animal Science at Colorado State University. Facilities she has designed are located in the United States, Canada, Europe, Mexico, Australia, New Zealand, and other countries. In North America, almost half of the cattle are handled in a center track restrainer system that she designed for meat plants. Curved chute and race systems she has designed for cattle are used worldwide and her writings on the flight zone and other principles of grazing animal behavior have helped many people to reduce stress on their animals during handling. Dr. Grandin obtained her B.A. at Franklin Pierce College and her M.S. in Animal Science at Arizona State University. She received her Ph.D in Animal Science from the University of Illinois in 1989. Today she teaches courses on livestock behavior and facility design at Colorado State University and consults with the livestock industry on facility design, livestock handling, and animal welfare. She has also authored over 400 articles in both scientific journals and livestock periodicals on animal handling, welfare, and facility design. She is the author of Thinking in Pictures, Livestock Handling and Transport, Genetics and the Behavior of Domestic Animals, Unwritten Rules of Social Relationships, Emergence: Labeled Autistic, and Humane Livestock Handling. Her books Animals in Translation and Animals Make Us Human were both on the New York Times best seller list. Temple Grandin didn't talk until she was three-and-a-half years old, communicating her frustration instead by screaming, peeping, and humming. In 1950, she was diagnosed with autism and her parents were told she should be institutionalized. She tells her story of "groping her way from the far side of darkness" in her book Emergence: Labeled Autistic, a book which stunned the world because, until its publication, most professionals and parents assumed that an autism diagnosis was virtually a death sentence to achievement or productivity in life. Even though she was considered "different" in her young school years, she eventually found a mentor who recognized her interests and abilities. Dr. Grandin later developed her talents into a successful career as a livestock-handling equipment designer, one of very few in the world. She has now designed the facilities in which half the cattle are handled in the United States, consulting for firms such as Burger King, McDonald's, Swift, and others. After she graduated in 1966 from Mountain Country School, Grandin went on to earn her bachelor's degree in human psychology from Franklin Pierce College in 1970, a master's degree in animal science from Arizona State University in 1975, and a doctoral degree in animal science from the University of Illinois at Urbana-Champaign in 1989. 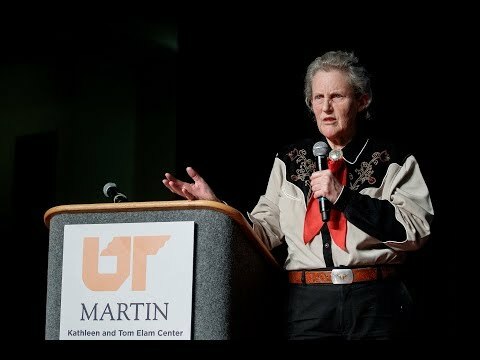 Dr. Temple Grandin currently works as a professor of animal science at Colorado State University and speaks around the world on both autism and cattle handling. There are three basic ways that people think differently when solving problems. They are photo realistic, visual thinking like me, pattern mathematical, which is the way most engineers think and word verbal thinking. When projects are being designed, people with different ways of thinking have complementary skills. To understand animals, you have to get away from words. The animal world is a sensory based world. Their memories are detailed pictures, sounds, smell, and other sensory impressions. This talk will help you understand animals but it will also give you insights into solving problems. Dr. Temple Grandin gets down to the REAL issues of autism, the ones parents, teachers, and individuals on the spectrum face every day. Temple offers helpful do’s and don’ts, practical strategies, and try-it-now tips, all based on her “insider” perspective and a great deal of research. Temple Grandin draws from her own experience with autism spectrum disorders and her professional career. She speaks on how to nurture and turn talents and special interests into paid work, jobs that are particularly suited to individuals on the autism spectrum, and much more. She provides First-hand accounts of job experiences and advice from individuals representing a broad range of careers particularly suited for high-functioning individuals on the autism spectrum. 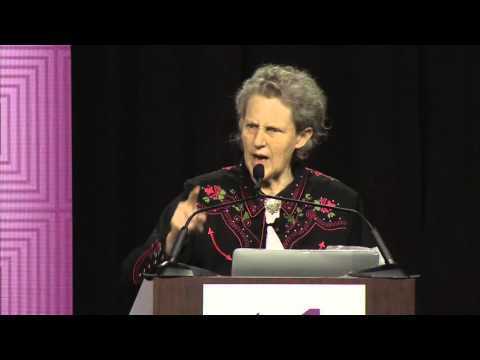 Dr. Grandin speaks about decoding social mysteries through the unique perspectives of autism. Often those with Autism/Asperger's suffer socially and professionally because social cues and perceptions hinder their lives. This enlightening and thought-provoking topic educates both those on the spectrum and their caregivers. -Executive Director, The Matthew Reardon Center for Autism, Inc.
“WE LOVE HER! She was amazing. Nothing less than a perfect fit!! Our community is better because of her visit.